The proposed new system of governance that will be decided in the upcoming referendum will ensure stability in Turkey for the post-President Recep Tayyip Erdoğan period, Foreign Minister Mevlüt Çavuşoğlu said on Tuesday. 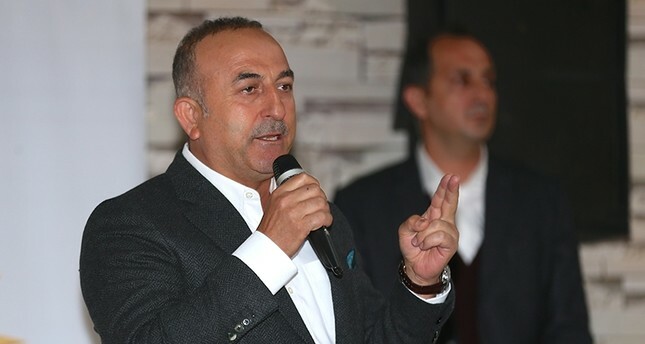 Speaking at an event organized by the Justice and Development (AK Party) Party in northwestern Sakarya province's Arifiye district, Çavuşoğlu defended the proposed constitutional reforms. "The [new presidential] system that we will bring is Turkey's insurance for the post-Erdoğan period. We should explain this very well," he said and added that the political system in the country needs to be strong and provide stability regardless of the leader. Çavuşoğlu added that if Turkey is powerful today despite all its hurdles from inside and outside, and if the Turkish economy is growing while other countries' economies are failing, it is not because of Turkey's current governance system, but because they have a leader like Erdoğan. He also said: "Why would Erdoğan need [more] power? The current constitution gives a lot of powers to the president." The foreign minister noted that there is more than one system in democracies and the current system in Turkey causes confusion and tension between the president and the prime minister. Moreover, he noted that 65 governments have been formed in the past 93 years in Turkey, while only 45 governments were formed in the U.S. in 225 years, highlighting the fact that the current system does not produce stability and productive governments. The constitutional changes have been discussed since Erdoğan was voted president in August 2014. The 18-article bill was passed by parliament in January, with 339 votes in favor -- nine more than needed to put the proposal to a referendum. The reforms would hand wide-ranging executive powers to the president and the post of prime minister would be abolished. The president would also be allowed to retain ties to a political party. Other changes would see the minimum age for parliamentary candidates reduced to 18 and the number of deputies rise to 600. Simultaneous parliamentary and presidential elections for a five-year term would be held in November 2019 under the new constitution.